What can you do this month at A B&B at Llewellyn Lodge? 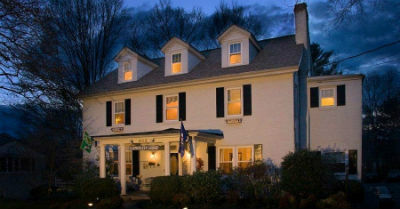 John & Ellen Roberts, full time professional innkeepers, welcome you to their Shenandoah Valley Bed and Breakfast at Llewellyn Lodge in Lexington, Virginia where they have been serving weary Shenandoah Valley travelers for over 31 years. They have had the great fortune in our B&B business of having been a part of many thousands of peoples’ happy & special occasions in their visiting Historic Lexington. The charming sixty year old gray brick Colonial is located in the quiet residential part of Lexington, Va. The friendly atmosphere of the Lodge combined with its comfort, convenience and great breakfasts bring many repeat visitors. Guests appreciate the fact that the Lodge has a large safe off-street lighted parking space.